Desmond Valentin and Robert Texeira chose the south side of Hawaii for an October shorecasting trip. Desmond got the big strike on his IRW Slider pole mated to a 550 Newell reel. 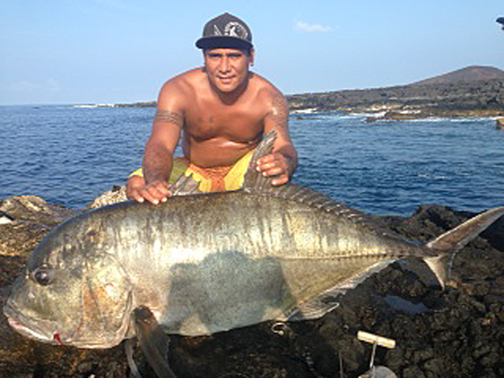 He battled the 122.7-lb ulua using 80-lb test Trilene line and the line was tested as the ulua took it into the reef. Eventually, Desmond hauled the monster to shore where Tyson Medeiros gaffed it and Desmond has his second 100-plus-lb ulua in HFN's 100 Plus Club.